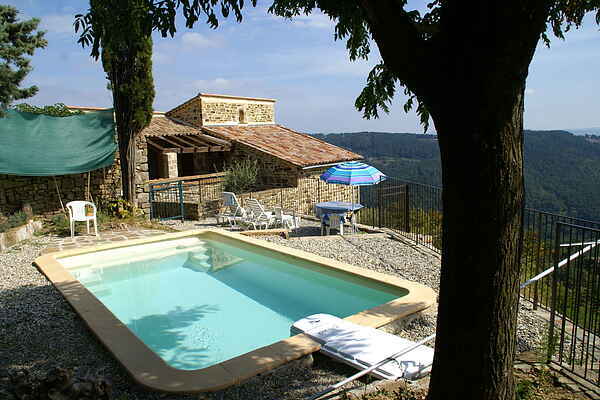 This beautiful detached stone house was fully renovated in 2005. Suitable for families with children or 4 adults. Second bedroom (with two 1 pers. Beds) is a children bedroom and suitable for adults. Extra guesthouse, accessible from outside, with bedroom with one 2pers. bed. The house is partially built on the mountain. Next to the house, you'll have access to a big terrace of approximately 500 m² with shade trees, garden furniture and a barbecue. The terrace also features a wonderful private swimming pool equipped with jet stream and surrounded by sun loungers. The terrain along the terrace is closed off with an iron fence but it does slope down, so please be careful with young children. In front of the house, there's a lovely partly covered terrace with garden furniture. At the back, there's a balcony with beautiful views of the green wooded hills complete with a telescope; a wonderful place where you'll spend a lot of time. To get there, drive up from Largentière (7 km) toward Rocher, then drive another 3 km along narrow roads to reach the house. From the house and from Rocher, there are several marked walking routes. The owner even has a GPS device available to use showing all the registered routes he considers worth taking. Attractions in the area include the medieval towns Largentière, Montréal (10 km), Labeaume (22 km), Balazuc (18 km), and Vogüé (22 km). The last two are located along the River Ardèche.